Pipeline on the north shore of Oahu is perfectly situated for a luxurious and relaxing Hawaii vacation. Swim or snorkel in the clear, blue ocean, hike in a verdant Hawaiian valley or just relax on a pristine beach and enjoy the day along one of Hawaii's most picturesque shorelines. Surfing, body boarding and beach walks are just a few of the popular activities on Oahu's north shore. This shoreline offers numerous protected cove areas with crystal clear water for great snorkeling depending upon ocean conditions. Tree-lined bike paths allow you to enjoy leisurely and scenic north shore rides. During the summer months the waters are typically very calm and perfect for ocean activities. During winter months large waves attract the world's best surfers who you can see displaying their skills at such famed surfing beaches as Waimea Bay, Sunset Beach and Banzai Pipeline. Several north shore beaches offer exceptional scuba diving and snorkeling. Sharks Cove is known for its thriving coral reefs as well as lava tubes and caves. From the marina at Haleiwa you can go on a deep sea fishing adventure. Visit Waimea Valley where you can choose from several guided hikes with spectacular overlooks of the valley and Waimea Bay below. Also offered are various daily activities including lei making, hula dancing, Hawaiian games and talks with botanical specialists about the valley's rich native flora. The list of activities offered on the North Shore of Oahu is extensive including golfing, hiking/biking, kayaking, stand up paddle boarding, horseback riding and more. At Dillingham Field you can take a glider ride or go skydiving. At the Polynesian Cultural Center in Laie you can learn about Pacific Island cultures through various interactive exhibits and themed villages as well as an IMAX theater. Oahu's north shore is famous for its beautiful beaches which come alive with waves each winter attracting the best surfers from all around the world. Professional surfing contest are held at numerous beaches including Banzai Pipeline, Sunset Beach, Waimea Bay and Haleiwa Alii Beach Park. During the summer months the waters of the north shore are typically very calm with conditions that are excellent for water activities including snorkeling, stand up paddle boarding, ocean kayaking, scuba diving and more. Take a surfing lesson or go on a guided kayak excursion to benefit from the local knowledge of the instructors and ensure your safety. Some north shore beaches provide more protection from the open ocean than others so check with lifeguards for safe areas to swim and enjoy the water during times of strong surf. The north shore's pristine, white sand beaches are always nice for beach walks and relaxing on the shore to enjoy the Hawaii day. Just a short drive from Pipeline is historic Haleiwa town which is the north shore's commercial and artistic center with a variety of dining options including sushi, Mexican, Italian, seafood and more. For fresh fruits and vegetables check out the Haleiwa Farmers market every Thursday in Waimea Valley which features live music as well as arts and crafts. Head down to the Polynesian Cultural Center in Laie for an impressive Hawaiian luau dinner feast accompanied by a theatrical dinner show. Visit the resort at Turtle Bay for fine dining as well as casual fare at the resort restaurants. Some great north shore shopping can be found in Haleiwa town with plantation-era buildings housing a variety of gift shops, art galleries, surf shops and more. On the east shore there are more than 100 shops at the Windward Mall, and a bit farther south in Kailua is a nice downtown area where it is fun to walk and browse the galleries and shops. Take a day trip from the north shore to Honolulu and Waikiki to experience an abundance of great shopping opportunities from the Aloha Tower Marketplace to the Ala Moana Shopping Center and the many shops along the Waikiki waterfront. A rental car is recommended when staying in Pipeline vacation rentals so you can explore the region's many exceptional beaches and attractions on Oahu's north shore as well as the scenic windward shore, and Waikiki and downtown Honolulu on the south shore. Most major populated areas of Oahu can also be reached on the public transit system known as "TheBus." Pipeline weather ranges from about 70 to 85 degrees F. throughout the year. Oahu's north and eastern shores are generally a bit wetter and cooler than the south and west shores, and the winter months typically see more rain than summer. Sunny skies, mild temperatures and warm trade winds make Pipeline an excellent vacation destination all through the year. Rain showers are typically brief and light with ample sunshine even on the rainier days. Hawaii's predominant trade winds blow from the northeast bringing moisture-laden clouds that typically rain onto the mountains of the east and north shores creating green and lush landscapes.Trade winds are almost always calmest in the mornings so it's a good time to visit the beach. Ocean conditions vary each day though typically the north shore will have the calmest waters during the summer months and the south shore will have the calmest waters during the winter. Some beaches provide more protection from the open ocean, and if the waves are too big at the beach you visit then you may be able to find a more sheltered beach where water activities are safe. For swimming and ocean activities visit Oahu's lifeguarded beaches. Make sure to obey all posted warnings and ask about the conditions on that day for the activities you choose. Pipeline vacation homes provide the optimal way to enjoy your Hawaii vacation with all the luxuries of resort living and all the comforts of home. Browse through our Pipeline vacation rental listings to get an understanding of the different amenities and property features we offer. 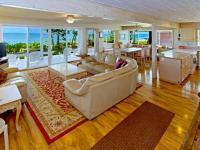 Our goal is to provide you with a with an unforgettable Pipeline accommodation for your dream Hawaii vacation. We take pride in having the largest selection of high-quality vacation rentals on Oahu and we stand behind our product, making sure only the best of the best Pipeline properties are listed on our site. If you have questions about our Pipeline rentals or which Oahu destination is best for your vacation needs, please give us a call and we will be happy to assist you. The world-famous Pipeline surfing spot was named in 1961 by Bruce Brown, a movie producer from California who came to the North Shore and filmed surfers riding the waves. As they were filming at the then-called Banzai Beach a construction crew was fixing an underground pipe on the main road, Kamehameha Highway. Brown's friend Mike Diffenderfer suggested they call the surfing spot Banzai Pipeline, and that's what it became in Brown's popular new surfing movie called Surfing Hollow Days.